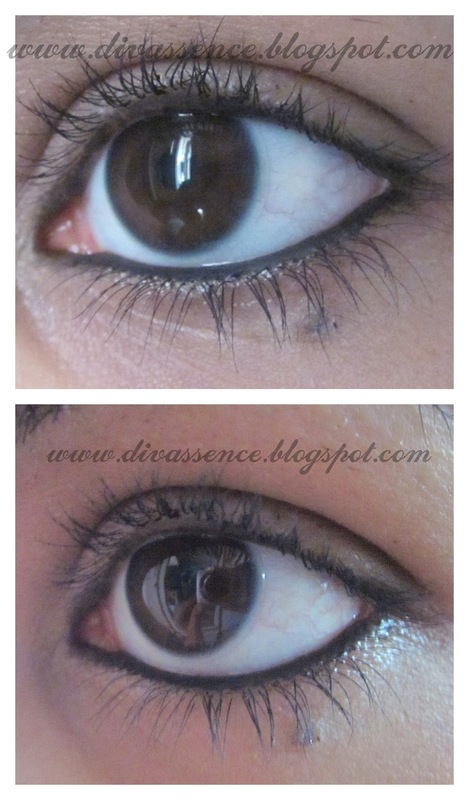 Lakme Eyeconic Kajal: Review/Swatch/EOTD - Divassence! I have an aunt who avoids complimenting others. If all of us love someone’s look she’ll pooh-pooh it. If I compliment one of my cousins/other aunts on their makeup or clothes she’ll try to out do them and put them down. She just cannot open her freakin’ mouth to give anyone a compliment. And one day it happened.. in her house .. when I had gone for lunch!! She said the kajal I had used looked really nice and dark and said it enhanced my eyes beautifully! Eh?? Really?? Then definitely the Lakme Eyeconic Kajal had worked its magic on me!! Packaging: The eye pencil is a sleek black retractable pencil. I personally loved the blue and black combination! The 10 hour claim: As much as I would have loved it to last on me for 10 hours, it lasted on me for approximately 6 hours and by the end of the 7th hour it had disappeared here and there on my waterline. Smudge Proof: This claim is true! I usually use it on my lower and upper waterline. It didn’t budge despite my watery eyes, sweat or rubbing! That kind of made this kajal a sure shot winner for me! Instructions on how to remove was given on the outer cover and yes ONLY use the Lakme Bi Phase Remover!! I tried using other removers but all in vain! Only the Lakme remover worked! Strange but true. Final Word: Absolutely love the Lakme Eyeconic Kajal! Even on my watery eyes it lasted for 6 hours which is pretty good (don’t go by the 10 hour claim by the way!) and it is smudge proof! Overall, it is definitely an Iconic.. oops!! Eyeconic Kajal! yes, thank God she doesn’t read your blog lol but even then, no harm if she did because she would realize her fault. Your makeup is worn to perfection, I guess she is just a born nag. Wow, magnificent, ♥ this kajal, your eyes look gorgeous.. I can’t wait for my Colossal to finish so I can buy this! Thank you Neha 🙂 This one is a must try! Looks like you are almost on a honeymoon with it!! Everyone is raving about it!! Wish my stash of liners were used up a bit more! I so want this!!! So, this is the magic wand that opened up your aunt’s heart! hahahaha!! Thankoo <3 Yep strangely it seems to be out of stock in every shop here.. Hmmm.. weird..